They say the heart of the home is always the kitchen. The kitchen can have many purposes within the home, it can be the one place in the day where the whole family, or busy couples, get together for breakfast or dinner and swap stories. It can be a welcoming room to escape in to be creative and experimental for those with a passion for cooking. It may be a large country style room with a warming Aga and seating, or a contemporary kitchen with minimalist design of simplicity and beauty, for these reasons a lot of personal choice and design needs to be considered when creating a bespoke kitchen. Waterhall Joinery have recently finished making a bespoke Kitchen Island Unit, where we were asked by the Client to design the unit not to match the existing kitchen, but to compliment it and provide a link to the other Oak furniture in the adjacent open plan dining area, linking the one room to the next. This enabled us to create a feature of the Island Unit in it’s own right, becoming a central focal point of the kitchen. Careful consideration was given to the design of the Kitchen Island Unit, so to maximise its purpose, whilst ensuring our Client would have all their wish list covered in the bespoke design. 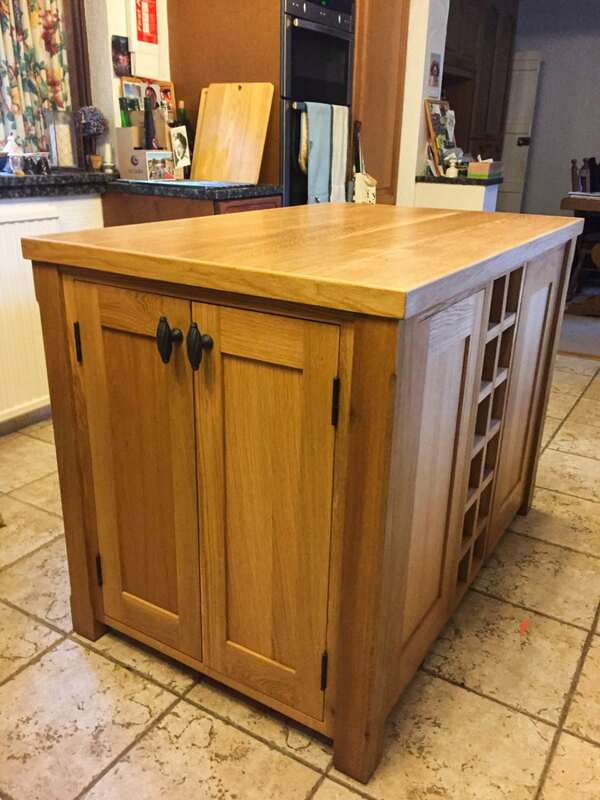 The unit needed to be made in 3 sections, as the doorways were very narrow, and the Island Unit would have to be re-assembled as sections on installation. As the existing kitchen had ample drawer space, thought was given to maximise the cupboard storage space within the Island Unit, including a wine rack for entertaining, and robust work surface to encourage full use of the Island Unit. 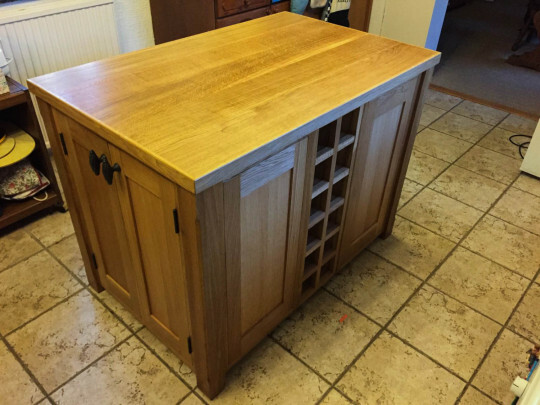 The final design was a solid Oak unit, with shaker style doors and simple styling to work well with the existing furniture. The handles and hinges were made in a rustic iron with bees waxed finish to give the unit a more rustic look and to compliment the simple oak style. The client was delighted on seeing the Unit installed, noting how beautiful the Unit looked and that this bespoke item had achieved its full potential.